The energy harvesting chain shows how some energy is extracted from previously harvested energy, and injected in short pulses back into the piezoelectric element to increase the overall amount of harvested energy. The increase occurs due to an energy resonance effect. Image credit: Lallart and Guyomar. ©2010 American Institute of Physics. (PhysOrg.com) -- Harvesting mechanical energy from the environment and converting it into electrical energy has recently become a viable method for powering low-energy electronics, such as sensors and actuators. But the major drawback of energy harvesting is how little energy it generates, which limits its potential applications. In a new study, Mickael Lallart and Daniel Guyomar from the LGEF Laboratory at the University of Lyon have proposed that an initial energy injection extracted from the harvested energy itself could greatly increase the total energy output; specifically, this method could generate 20 times more energy than normal when using off-the-shelf components, and up to 40 times more when using low-loss devices. Energy harvesting often uses piezoelectric materials, which have the property of generating an electric field in the presence of an applied mechanical strain. As Lallart and Guyomar explain, piezoelectric materials usually have a low global coupling coefficient, corresponding to a low conversion ability. 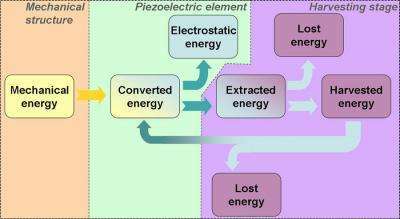 Although the coupling coefficient is an inherent property of a material, the scientists explained that they can artificially enhance the conversion abilities of piezoelectric materials by using a pulsed initial energy injection. In the proposed scheme, harvested energy is first extracted from the piezoelectric element via a microgenerator. The energy is then injected as a quick pulse back into the piezoelectric element through either its top or bottom electrode, resulting in a positive or negative voltage, respectively. The energy injection creates an “energy resonance” effect due to the pulsed energy feedback to the piezoelectric material. Due to this energy resonance effect, the initial energy injection to the piezoelectric material creates an overall energy gain that is higher than the energy initially extracted from the piezoelectric material. The researchers identified an optimal energy injection value, after which higher values create a damping effect on the piezoelectric material that results in a significant decrease in the mechanical energy available for harvesting. When optimized, the proposed design could allow a device to use much less piezoelectric material than a standard design, and still harvest the same amount of energy. As the scientists explained, most previous methods for energy conversion enhancement have been “unidirectional,” meaning they don’t take advantage of using the energy generated from the device itself as input energy. The few previous methods that were “bidirectional” like the current design, using output energy for input energy, required constant driving of the device, resulting in a complex implementation and requiring a significant amount of energy for driving the system, which made them barely realistic. In contrast, the fact that the new method only requires quick pulses allows for an easier implementation and greatly reduces the driving energy. The energy extraction and injection processes are so much quicker than the device’s vibration time period that they can be considered instantaneous. For these reasons, the scientists predict that this approach could improve the amount of energy harvested by two, three, or four times compared with other methods aiming at increasing the power output, even at low energy extraction efficiencies. Due the extramolecular bindings, the static friction is usually large, then the dynamic one. At least ten men are required to get the wagon in motion, but after then only one man is able to keep it running. Short pulse of energy helps to overcome static friction. umm, except that here, you've primed the crystallographic unit cell to be in a "pre-polarized" state. that's why this works - read the full paper. I'm so freakin' excited -this rocks!!! Not likely. While you may increase effsome, you'll only get up to 100% of the original energy input but unlikely to get even that. 40x's is a joke. maybe 2x's.